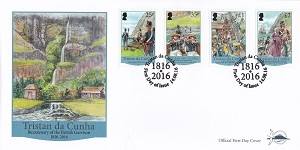 Discussions about Great Britain taking possession of Tristan da Cunha began in 1815. Captain Peter Gordon of the East India Company's ship Bengal Merchant stopped for several days at Tristan in November 1814 and encountered Tommaso Corri (known as Thomas Currie), the only survivor of the American Jonathan Lambert's project to settle Tristan. In May 1815, at Currie's request, Gordon, addressed a letter to the government of the Cape of Good Hope Colony seeking British aid and protection. Britain had taken control of the Cape in August 1814. The Governor, Lord Somerset, forwarded the letter on to Earl Bathurst, the British Secretary for War and the Colonies, asking "sanction for taking a formal possession of the [Tristan] Islands in His Majesty's Name". He cited Gordon's views on the benefits of the islands as a watering stop for ships sailing to India and China, but he particularly noted that the Americans had used the islands as a rendezvous point for cruisers and privateers attacking British ships during the War of 1812. Taking possession would deter further mischief by the Americans or any other power. As if to emphasise the point, Lord Somerset's letter arrived in London about the same time as news of the capture of HMS Penguin off Tristan by the USS Hornet. Following consultation in September 1815 with the Prince Regent (the future King George IV), Bathurst sent authorisation to take possession of Tristan as a dependency of Cape Colony. Lord Somerset, however, delayed taking action because of the winter weather. Meanwhile, separate orders were enacted on St Helena, where Napoleon Bonaparte had been newly exiled. It is unclear if they came from the government in London or were issued by the Governor, Sir Hudson Lowe. In any case, Rear Admiral Sir Pulteney Malcolm, dispatched HMS Falmouth from the naval blockade to Tristan under Captain Robert Festing. He was to take possession of the island with a temporary garrison, and then proceed with a letter to Lord Somerset at the Cape, with orders to provide a permanent garrison. HMS Falmouth arrived at Reception Bay, Tristan (soon renamed Falmouth Bay) on 14th August 1816. He found two men living there, Thomas Currie, a native of Livorno, Italy, and his servant boy Bastiano Camilla of Mahon, Minorca. Festing departed Tristan for the Cape after three days, having also taken possession of Nightingale and Inaccessible islands. He left a small garrison of seamen and marines under the command of Lieutenant David Rice RN. Festing's arrival at the Cape brought matters forward, and Somerset wrote to Bathurst on the 24th October 1816 with full details of the army garrison he was sending to relieve Lieutenant Rice and his men. The new garrison under the command of Captain A.Josias Cloete, 21st Light Dragoons sailed for Tristan on HMS Falmouth, and arrived at Falmouth Bay on the 28th November 1816. The other officers were Lieutenant Aitchison, Royal Artillery, Lieutenant Atkinson, 72nd Regiment, and Medical Hospital Assistant Dr Evers. Captain Dugald Carmichael, 72nd Regiment, also accompanied them to make a botanical survey of the island. Much of the stores and livestock were lost or damaged during the rough passage, and they had difficulty manhandling what was left up the cliffs to the plateau. Lieutenant Aitchison set about building a defensive work named Fort Malcolm above Little Beach. Somerset Camp (named for Lord Somerset) was established further inland, and tents were gradually replaced by huts and stone buildings. They also built a much needed road from the beach to the plateau. A census appended to a report to Lord Somerset by Captain Cloete states that on the 7th December 1816 there were 72 people living on the island, including 5 officers, 36 NCOs and privates, 9 male civilians, 10 women and 12 children. At Cloete's request, Captain Festing had left a boat's crew consisting of a coxswain and 5 seamen capable of handling the treacherous waters around Tristan. There were also 6 Hottentots. One of the artillery drivers was Corporal William Glass. He, with his wife and children, stayed to become the founders of the new colony after the garrison left Tristan in 1817. Somerset Camp was later renamed Edinburgh in honour of Prince Alfred, Duke of Edinburgh, who visited Tristan in 1867. 25p - A six pound carronade with Royal Artillery crew at Fort Malcolm, which was established above Little Beach. 35p - Lt. Rice landing on the 14th August 1816, with Currie and Camilla waving the Union Flag as they approach. £1 - Capt. Cloete arriving to relieve Lt. Rice. £2 - Corporal William Glass arriving with his pregnant wife Maria and 18 month old son. The first day cover illustration is based on a sketch of the artillery huts at Tristan in 1816, drawn by Midshipman CW Browne of HM Sloop Julia.